This is the Happy Kava Ginger Tincture Blend. Happy Kava Brand has expertly formulated a line of Kava Tinctures that take the best of organic or wildcrafted herbs. There are a number of herbs that have made it into the mainstream. Even those not super familiar with different herbal products have now probably at least heard of the 12 herbs we have chosen to blend with our Noble Kava Root with the Happy Kavalactone lineup. Kava can help promote feelings of well being and calmness. But for some, Kava can also bring about some stomach discomfort. For those with sensitive stomachs, but who still want the pleasurable benefits of Kava, then the Happy Kava Ginger Kava Tincture Blend is definitely for you. This has made our Happy Kava Ginger Kava Tincture Blend our #2 seller here at Kava Blends. We add the equivalent of one-half teaspoon of Ginger into every serving of this tincture (4 dropperfuls is a single dose). We don’t add any other filler herbs that may or may not actually have the stomach-soothing and anti-nausea properties that Ginger has. All we have in this award winning Ginger Kava Tincture Blend tincture is pure Noble Kava root with a 2-4-6 or 4-2-6 Kavalactone lineup and pure Ginger root. *These statements have not been evaluated by the Food and Drug Administration. 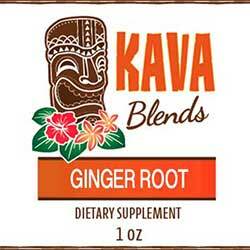 This Happy Kava Brand Ginger Kava Tincture Blend is not intended to cure, treat, diagnose, or prevent any disease.